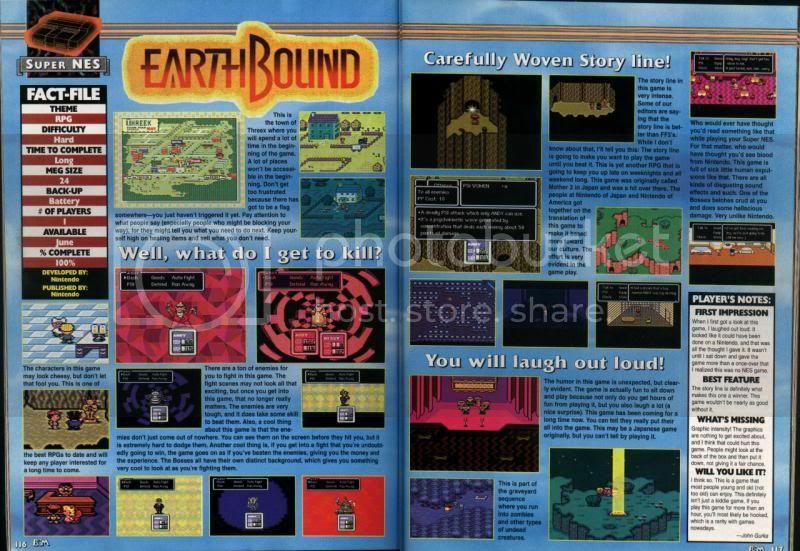 I first came across EarthBound in the June 1995 issue of Electronic Gaming Monthly in a two page review. I had never heard of the game before and despite the review not being particularly great it did the job of intriguing me. At this point in time I was not an RPG fan at all. Sure I had played bits and pieces of games like Final Fantasy and Dragon Warrior but for the most part my then 12 year old self spent most of his time playing platformers, fighters and brawlers. The closest I really got to playing RPGs were games like Crystalis and The Legend of Zelda. Despite my general complacency towards the genre, something about EarthBound; whether it was the graphical style, the modern setting or the promised humor it really made me want to play it. When I finally got my chance to do just that, I was pretty much drawn in completely and almost beat it in the rental period. Since then I have bought two copies of the game and it is one of my most beaten games ever in the range of more than 20 times since when I got my first copy (my second one was to replace the copy that was given away behind my back). I will do my best to balance my love of EarthBound with some honest criticism of the game. It will be tough, but I think I can do it. The year is 199X in the sleepy town of Onett when suddenly a meteor strikes and instead leaving the surrounding area nothing but a smoldering crater it only causes a mild irritation that wakes up the neighborhood and causes the Onett Police to blockade everything. They are proud of their blockade making, you know. Anyways this wakes up our hero, Ness, and being the inquisitive young man he is sets out to see what caused all the commotion, after changing out of his pajamas at his mother’s request of course. After returning from the mountain, talking to the police and his annoying next door neighbor Pokey Minch, Ness goes back to bed only to be woke up by arguably the most annoying knock of all time. It is Pokey. He says his younger brother, Picky, has gone missing and he wants Ness to help him find him. So Ness, with his dog King, join Pokey and head back to the top of the mountain and find Picky who was abandoned there by Pokey. After being joined by Picky a strange light emanates from the meteor and a buzzing sound is heard. From the light, a being from 10 years into the future, Buzz Buzz, greets Ness and tells of him of his destiny as he and 3 friends are fated to confront and defeat the being known as Giygas who is out to destroy the world if he is not stopped. After defeating another being from the future, Starman Jr., and returning Pokey and Picky to their parents (with implied child abuse by their father) Buzz Buzz makes the fatal mistake of getting too close to Pokey’s mother who mistakes him for a Dung Beetle and subsequently smashes Buzz Buzz with a mortal blow. In his dying breath, Buzz Buzz gives up some final information about Ness’s journey, finding the 8 Sanctuaries and gives him the Sound Stone to Ness, which he will use to collect 8 pieces of a melody necessary to unlock the power to defeat Giygas. And with that, Buzz Buzz dies and Ness sets out on his adventure and to save the world. Everybody get that? Good. 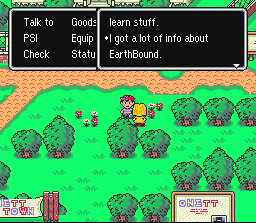 As you can see, unlike Mother, there is little ambiguity about what the mission for EarthBound is. You are told straight out that you have to go collect these 8 melodies and defeat the evil Giygas. Really though the journey is why we play the game and not necessarily the end. What unfolds is one of the more unusual RPGs on the Super Nintendo. Spread out through a world that is very strange and filled with quirky characters who you will talk to, fight with and make allies with. It might not be for everyone but for those who get it, they will surely find a memorable game that has garnered a cult fan base unlike any game or franchise out there. Controlling EarthBound could not be any simpler. In fact the controls are so simplified you can play the entirety of the game using only your left hand. Obviously the d-pad moves you and the L button works as an all purpose Talk/Check button meaning you will not have to go into menus just to talk to NPCs or open presents. Use select to cancel out. No hassle whatsoever. Of course if you insist you can also use A and B for those functions and X will open the map. And if you get yourself a bicycle, you can use the R button to ring the bell. That with the hug button in A Boy and His Blob ranks as one of the best single use buttons in all of gaming. Despite the weirdness so pervasive throughout EarthBound the gameplay is not all that much different from the standard RPG though it manages to do a few things that set it apart from other RPGs of the time. Like Mother you adventure around the many strange and not-so strange locations of Eagleland. Talking to NPCs, battling enemies and buying/collecting items for use by your characters or other characters to advance through the game is pretty standard stuff though what you hear, fight or collect might not be completely of the ordinary. Maybe the biggest innovation for the gameplay is the total lack of random battles, which after playing through Mother’s slog of often getting into a random battle only a few steps after your last is quite a relief. All enemies you fight show up on the over world map and you have the options to avoid, run away or fight them. What else makes it so good is the, for the lack of a better term, instant win system. Depending on how you go into a battle you can get a free turn or the enemy will get one. By sneaking up from behind an enemy a green swirl will flash and you will get first attacks and possibly an instant win if you are strong enough. Conversely, if you are caught from behind the screen will flash red and the enemy will get a free round. And if you are well over leveled (or in some instances beat certain bosses) enemies will run away from you making it completely up to you whether you want to grind some more or be on your way. This completely takes away the annoyance of having to fight weak enemies in places you have already been which is arguably the biggest drag in any RPG. The battle system is much like Mother with standard attacks (Bash), magic (PSI), Defend and Item being universal with each character getting special commands such as Run, Pray, Spy and Mirror. The unique commands have their uses though outside of run and one other command in a certain situation they might not see much use depending on how you play. Otherwise the battle system works about the same as any others. You attack, use PSI attacks or defend against your enemies attacks until you lose or defeat them. 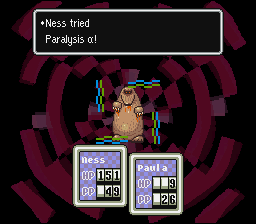 Though there is one major thing that changes up the strategy of battling in EarthBound and how you go about fighting, the rolling health meter. In most RPGs the damage you take is immediately removed from your total HP and if an attack is greater than your current HP you die. In EarthBound, your HP meter rolls slowly down towards its destination meaning that if you are quick you can make the save if your characters take a mortal blow. It affects the dynamic of a battle and makes major attacks not as big a threat as they could be. Though if you get complacent you can still die pretty quickly if hit with several strong attacks. The battles themselves are fought from the first person perspective found in Mother with a static, but well drawn enemy sprite in front of your team. In EarthBound though they added a background based on, I believe fractals. 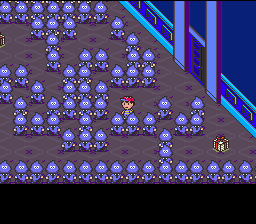 They do not really add anything to the fight other than give you a rather trippy background to fight the various enemies that populate EarthBound's world. And just like Mother you gain experience towards leveling up your characters which has expanded for EarthBound and the money you get for defeating enemies is sent to your ATM card by your contacted only by phone father. One stat is particularly important to the battle system and that is Guts. What Guts does is not only increase the chances of your characters getting Smash attacks (which are the game’s critical hits) but also gives you a better chance of surviving a mortal blow. So instead of dropping your character’s HP instantly it will roll down to 1 giving you a chance to heal him or her before the character is finished off. While not something to rely on, it certainly can save you time and resurrection items in a pinch. The characters all have their niche to fill in the game as well. Ness of course is your strongest overall attacker and like Ninten before him, strangely your best healer. 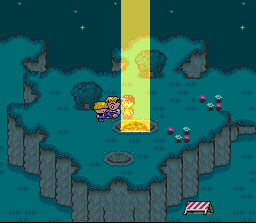 Unlike Ninten though Ness gets a pretty strong PSI attack known as Rockin (or whatever your favorite thing is) as well as sporting a range of status affecting PSI and healing/life recovering PSI. And just like Ninten, Ness makes use of baseball bats to bash his foes heads in. He is well balanced though he does have the drawback of becoming homesick on random intervals in which he might lose a turn and you will have to get him in contact with his mother right away to remove that problem. By the end of the game Ness can become so strong in attack, and defense as well as total HP and PP that he basically becomes a healing tank. Paula takes the role of Ana and has many strong elemental based PSI attacks as well as some status attacks. Her weapon of choice is any number of frying pans sold throughout Eagleland. Physically she is weak though as her defense and offense never gets too high and she will be lucky to get just over 300 total HP even if you max her levels to 99. She does end up with a lot of PP though so you will get plenty of use out of her strong PSI. Her “Pray” command grants 1 out of 9 possible things to happen though not all of them entirely useful and you might not want to bother taking the risk. Jeff takes Loid’s role in this game and has a few advantages over him. He uses guns and beams as his means of attack but has the drawback of not being able to hit Smash attacks with them and he cannot use PSI attacks at all. He makes up for his lack of PSI with inventory weapons. 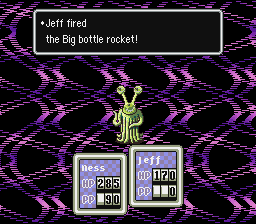 While he is not the only character who can use bombs this time, he does have several bottle rocket types to use which can cause massive amounts of damage as well as other inventions that can be used in battle to affect status or cause damage to enemies as well as help his friends at his disposal. Also given enough IQ and a stay in a hotel or the like, Jeff can repair a number of broken items found around the world to use as regular equipable weapons or inventory items. His special command is the “Spy” command which lets you look at the enemies stats and on occasion will let you see if the enemy has any special items on it that you can steal, which can certainly be helpful if you are looking for the 1/128 items in the game. Finally Poo kind of replaces Teddy but improves on him quite a bit as a permanent 4th member instead of a temporary 3rd character. He is sort of a cross between Ness’s strong physical stats and Paula’s strong PSI with some of Ness’s healing abilities thrown in for good measure. He also gets his own special PSI attack called Starstorm which is up there with Rockin as the strongest PSI attack in the game. While he does have a lot of HP that almost matches Ness, he does not get quite the same amount of PP that Paula achieves and some of his abilities tend to eat through it at a much faster rate. Despite that he is a very flexible character, especially after you get him his only weapon in the game, the Sword of Kings. Poo does have some quirks that often make him a bit harder to use as well. For the most part he cannot recover the HP/PP from the hamburgers, pizzas and other western style foods that others can eat, meaning that unless you head to Dalaam to stock up on stuff that he can consume you will probably more likely just using life recovering PSI to keep his HP up. His unique command is called “Mirror” and he uses that to become whatever opponent you facing and attack using its abilities. The biggest complaints I suppose one could say about the gameplay is that overall it is rather simple. Around this time SNES RPGs were getting more and more complex in terms of how battles are fought and EarthBound‘s decidedly simpler style might feel antiquated compared to Final Fantasy III (6), Chrono Trigger or even Super Mario RPG‘s more intricate battle system and this is a fair enough complaint to make. Another criticism might be the rather limited inventory system, which while more realistic than other game’s systems where you can seemingly carry an astonishing amount of many items, it does make you have to think very hard about what you are willing to part with or keep. My biggest complaint about it is that your equipped weapons do not leave your inventory like they did in Mother. Those four extra spaces that could have otherwise gone to extra items can sometimes feel like a burden especially if you have stuff you do not just want to drop or in some cases cannot get rid of anyways. The game does offer a run over inventory system where you can either go home to Ness’s sister, Tracy or call the Escargot Express (also Tracy) to pick up or deliver necessary items almost anywhere in the game as long as you have $18 and a phone nearby. So making intelligent use of that system can certainly make things easier for you if you are having inventory management problems. And that really is all I can say is “flawed” about the gameplay. 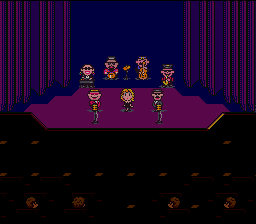 Arguably the most “controversial” aspect of EarthBound’s presentation is the art style. 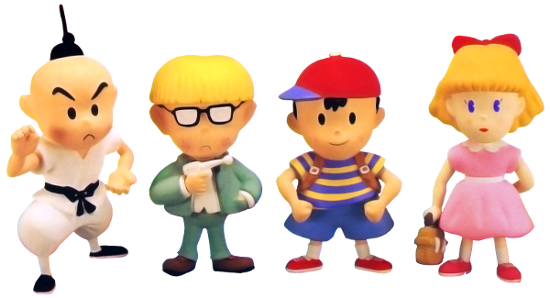 Much like how Mother went with a simpler art style than its contemporaries at the time, EarthBound also went with a more simple, “cutesy” style. It was arguably one of the biggest barriers for a lot of people to get into the game after such graphically stunning games like Super Metroid, Final Fantasy III and Donkey Kong Country had been released the year before and future beautiful games like Chrono Trigger, DKC2, Yoshi’s Island and Super Mario RPG being on the horizon. So in a certain regards its style is certainly more plain than those games. And with the more animated sprites that FF3, Chrono Trigger and SMRPG would make use of screenshots of EarthBound would certainly give off the impression of a more lifeless game than what is actually there. But I feel that EarthBound’s graphics give the game a charm that few games really can match. The game is full of bright, vivid colors which gives off a lighthearted atmosphere that few RPGs had at the time with their even then more generally serious tone given off. Despite that it is hard to argue exactly why I like the graphics so much since it really is a matter of taste and even I recognize that the graphics hardly push what the SNES was capable of. Still the graphics did some things that other RPGs did not do at the time. When you consider the towns, even the more alike ones like Onett, Twoson and Threed (it took me until I had bought my 2nd copy that I realized the naming joke), all have a different feel to them unlike a lot of towns in other RPGs that tended to have very similar building styles throughout the world. Another thing that is great about the graphical presentation is the variety of NPCs that populate the world. While most RPGs had a small handful of sprites reused several times a town. In EarthBound up to 12+ different sprites per gender with unique character sprites for some characters means that in each town very often you will not see the same sprite show up and if you do they are usually in buildings in town and not on the same exact screen. In fact that variation in sprites is so good that when visiting towns such Saturn Village and Tenda Village, the repeated NPCs used make those towns seem particularly alien to the rest of the game’s world. That variation that even today is not that particularly common and builds a more varied and interesting world in way that even FF3 or Chrono Trigger cannot match. This is just added on to the attention to detail that Ape lavished onto the world they created and really cannot be appreciated without playing the game. 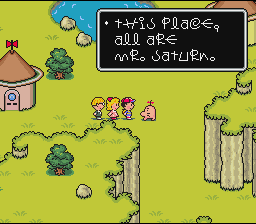 To say that I think EarthBound's graphics are underrated should go without saying. Finally the battle graphics, which I mentioned earlier, with the static sprites they are nicely drawn and have a unique character to them. Though they do not have any animation at least they are interesting to look. Along with the rather mesmerizing backgrounds which add to the game’s eclectic charm without getting tiring to look at. The PSI attack effects are also quite cool as they add another layer of psychedelic flavor to the experience. There really is not all that much to say other than all together the battle screen can be pretty fun to watch when all the right effects are going off. If you were not paying attention, I just recently posted a Top 10 of My Most Favorite EarthBound songs. So it should go without saying that I feel EarthBound’s soundtrack is one of the best and most varied on the Super NES. From the upbeat, happy music of Onett, the weird tunes of Saturn Village to the Jazz Band stylings of the Runaway Five, to the almost mechanical feeling music of the last areas and the melancholy music that really sets a good , EarthBound’s music is always interesting to listen to and generally keeps the atmosphere fresh from area to area with no theme being repeated especially in the over world. If you want to get a better understanding of how I feel about the game’s music just click on the link to my top 10 (hint hint) and you may understand why I am such a fan of EarthBound‘s music. This soundtrack was one of the reasons why EarthBound stuck with me and the fan base throughout the years. I mean the amount of fan music created in the honor of the game is rather breathtaking. The sound effects are also well done giving attacks a certain oomph to them. PSI attacks sounds appropriate for the kind of attack. Freeze sounds like ice, fire sounds like something burning, lightning sounds like lightning strikes and so on and so forth. The PSI Rockin and Starstorm all have satisfying explosion sound effects that deliver a feeling like you are really pounding on enemies with devastating attacks. Outside of that most effects are standard SNES sound that do their jobs quite nicely. And the last bit to talk about, the translation. 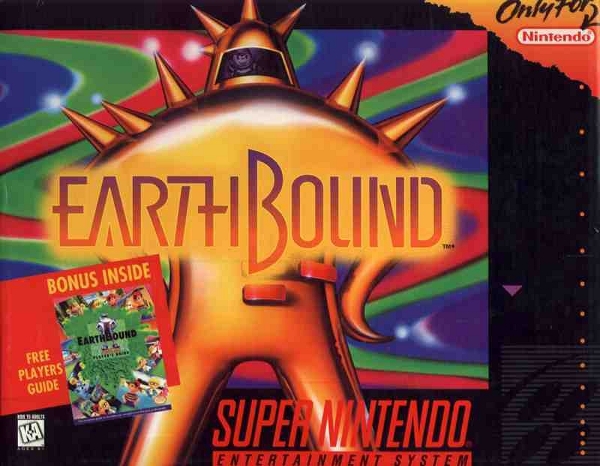 While Mother got a pretty decent NES era English translation, EarthBound got arguably one of the best ever. At least according to the people I have heard from who can read and speak Japanese and have played both versions. Since I cannot I will just have to take their word for it. Still the dialog in the game is very funny with a bunch of weird bits of speech that adds so much to the world. Where a lot of RPG NPCs usually will give bland exposition that may or may not help you, EarthBound NPCs tend to say things that give the impression that they are going about their days just as any normal person would, entirely unaware of the peril that threatens them and the entire world. Usually it is worth talking to some characters several times a game in various circumstances to see just what they say. I have come across lines of dialog I have never seen before even now because circumstances just happened to be right. Throw that in with all the references (so many Beatles references) and 4th wall breaking humor and you have a game that was one of the more clever videogames of the ‘90s. 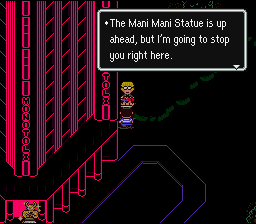 The weirdness that permeates EarthBound is hard to describe. The game itself is a bit of parody of RPGs of the era (funny that it would be my first full RPG experience) and takes a certain amount of pleasure of skewering the tropes and accepted strangeness that is found in all RPGs. Heck one dungeon later on in the game pretty much dissects the odd nature of the dungeon. “Why does it exist? Who built it? Why are there monsters there?” are questions that are discussed within and just typifies why EarthBound is self-aware but yet it is not necessary to have played RPGs or games like them to fully appreciate the weird world. In a lot of ways it is similar to how Conker’s Bad Fur Day would deconstruct the platformer 6 years later, albeit nowhere near as vulgar. 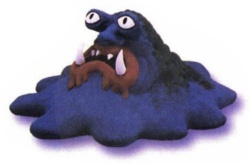 Though we were fighting sentient piles of vomit well before we were fighting The Great Mighty Poo. 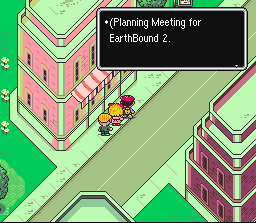 With EarthBound finally being released on the Virtual Console by the end of this year (at least we hope), hopefully a lot of people who missed it back then will get a chance to play. And maybe even more people will discover why so many of us who were drawn to this game back in 1995 are still rather obsessed with it even to this day. Plus it will be a lot cheaper than trying to track down a used copy on the market. Maybe we can have an NW Epic Center around when it is released and everyone can share their experiences together., whether it is their 1st time or who knows how many times like myself. Also here is some nice extra content. A better overall written breakdown of the game and two great reviews by Roo of the Clan of the Gray Wolf and the Happy Video Game Nerd. Also I would like to thank Zero for helping me out with formatting issues I was having. Otherwise this nearly 5 page review would have had to be divided to allow for the formatting to take. Wow... What a review, chrisbg99! I think you touched upon just about everything one could, and for a game with such an incredible amount to it, you handled things most admirably. EarthBound nails nearly every single element regarding what makes a game more than a game. 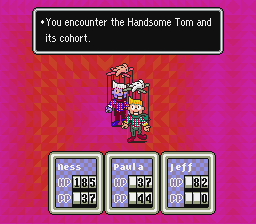 EarthBound is an experience unlike any other. Your score is spot on, and I, too, hope all those that have been wanting to play this game, or have even remotely thought about playing this game, give it a chance - especially with an open mind. It truly is one of a kind. I'm also delighted that you did the review for this game. I keep thinking I should contribute more by doing a review, and the only review that really felt right for me to do was one for EarthBound. But a game that means so much to me, and a game that is so robust in all the right ways, it was a daunting task to even consider. So, thanks! Oh, and I liked your comment about A Boy and His Blob. More games need a hug button. I just don't see this as being a worthwhile RPG, despite this glowing review. I'm just gonna go replay a far better RPG; Final Fantasy 7. I heard that this game is coming to some kind of virtual console in the near future. Might just have to check it out. Nice write-up! I think I pretty much agree with all of that. Personally, I'd give it a 9.9. Oh man, you know exactly what buttons to push! Might as well walk into a Metroid Prime review thread and say Halo's a much better FPS. Next up, I'm going to reply to a thread by Anand praising the aspects of scanning in Metroid Prime. Fantastic review, Chris. Always great to read an enthusiastic but well-considered review from a good writer. I'm really looking forward to getting to play this one, finally. Scanning is a neat aspect of the series! One day we will come to blows, sir. One day. And on that day I will stand over you as the victor for all the world to see. And in the future the children will sing, the men will tell bawdy tales and the women will blush by the very thought of my great victory over you. And there will be great joy all over the land. And for the rest of you, thanks for reading my review. slow breathing. Take deep breaths. ...okay, I'm fine now. I'm fine. EDIT: Geez, GDG's ribbing took me off track lol... good review, and I definitely agree about the item/equipment issues. I get the feeing they did that purposely, but even with that being the case I wasn't a fan of it. I still need to beat this, about half-way through it last I checked. Wonderful review! I'm glad you mentioned the rolling battle system. It feels so good to heal yourself from the brink of the pink. I keep flip-flopping on which I like more: Earthbound or Mother 3... One thing's for sure, I shall be playing through this gem again sometime soon. I played Mother 3 last year and I really enjoyed it, the best told story in the franchise, but I just can't put it over EarthBound partially out of bitterness for Nintendo's jerking us around but mostly that EarthBound just had a greater impact on me. Like I said in the review EarthBound was the game that opened the genre for me. So EarthBound was released, surprisingly, today. That is just fantastic. Now go buy it if you can. I don't want to hear excuses. Anyone on the fence about it should read this.